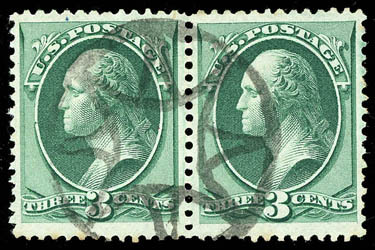 Star Geometric, sharp strike on 3¢ green (158) horizontal pair, well centered; trivial perf toning, Very Fine; with 2003 P.F. certificate. Weiss No. ST-8P6 Estimate $150 - 200. 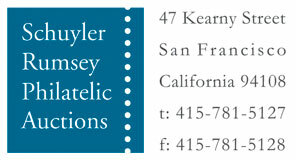 8-Point Star Geometric, bold strike on well centered 12¢ blackish violet (162), rich color on bright paper, Very Fine. 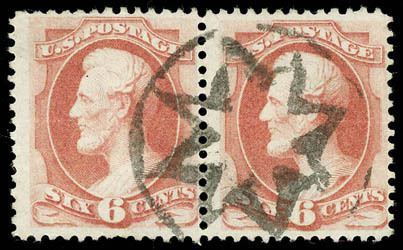 8-Point Star Geometric, two bold strikes cancel 6¢ dull pink (159) strip of four, well centered throughout; left stamp repaired and right small flaws, Very Fine strikes, The largest recorded multiple with this cancel., ex-Ainsworth; with 2004 P.F. certificate. Weiss No. ST-8P6 Estimate $200 - 300. 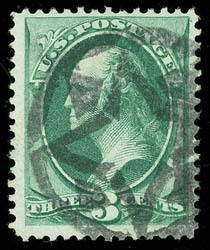 Circular Star Geometric, bold strike on 3¢ green, grilled (136), nicely centered with strong grill, Very Fine; with 2005 P.F. certificate. Weiss No. ST-8P10 Estimate $100 - 150. 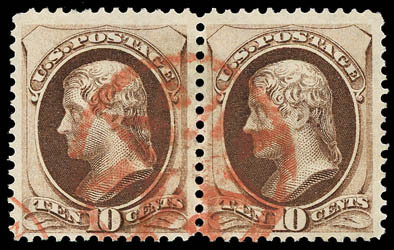 8-Point Star, two strikes in Supplementary Mail red on reattached 12¢ dull violet (151) strip of three, small flaws, scarce and Very Fine appearing multiple, Scott $705. Weiss No. ST-8P11 Estimate $200 - 300. 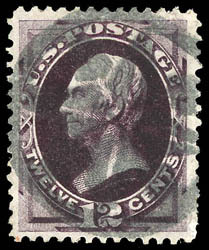 8-Point Star, strike ties 6¢ carmine, split grill (137 var.) on small piece, hinged in place to check grill, red "New York Jun 13" exchange cds at left, Fine and attractive; with 2003 P.F. certificate. Weiss No. ST-8P11 Estimate $150 - 200. 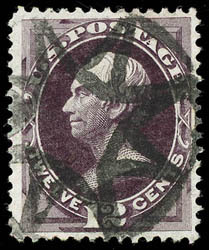 Circular Star Geometric, bold central strike on 12¢ blackish violet (162), well centered within jumbo margins; small faults, Extremely Fine appearance. Weiss No. ST-8P11 Estimate $100 - 150. Circular Star Geometric, bold strike in Supplementary Mail red on 10¢ brown (161) horizontal pair, nicely centered with rich color on bright paper, fresh and Very Fine, A lovely pair. 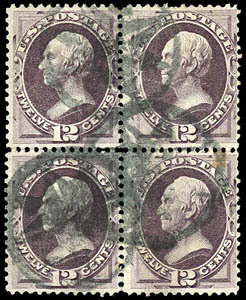 Star in Circle, three strikes on 1870, 12¢ dull violet, block of four, strong color, reperfed at left and light creases, Fine appearance, a rare multiple. Scott No. 151 $2,250. Weiss No. ST-8P11 Estimate $1,000 - 1,500. 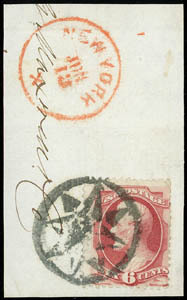 8-Point Star in Circle, bold strike ties 6¢ dull pink (159), light crease, Very Fine and scarce strike on pair, Illustrated in Weiss on page 166., ex-Ainsworth. Weiss No. ST-8P3 Estimate $150 - 200.